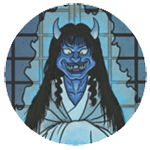 APPEARANCE: Sagari is a strange apparition from West Japan and Kyushu, particularly Okayama and Kumamoto prefectures. It takes the form of a grotesque horse’s head, which drops down from hackberry trees to startle travelers on the road. BEHAVIOR: Sagari don’t do very much other than dropping down right in front of someone’s face and screaming their unholy cry. However, those who hear a sagari’s whinnying and screaming may be stricken with a terrible fever. ORIGIN: Sagari come from the spirits of horses which die on the road and are discarded and left to rot where they fall. 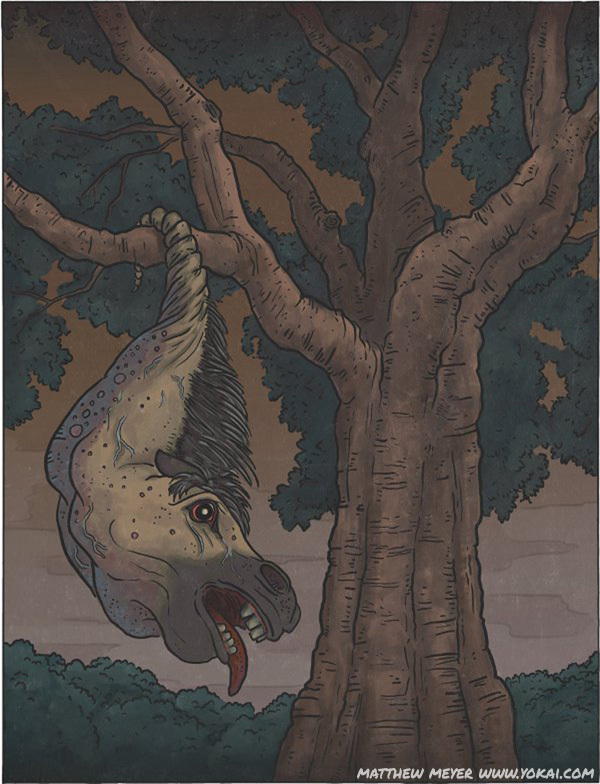 The horses’ souls sometimes get caught in the trees as they rise from the bodies. The ones that stick in the trees cannot pass on to the next word and transform into these yokai.